Please enter a 4 digit year. This is only used for statistical purposes to allow the club to understand the age profile of the membership. We need your address to send you your Club magazine and other Club information. We will not give your address to any third parties without your consent. We need your email address to verify your identity when you wish to access your membership record in the future. We will also use your email address to send you information about the Club. We will not give your email address to any third parties without your consent. We need your telephone number to telephone you very occasionally for club business. We will not give your telephone number to any third parties without your consent. Optional, but if you have another telephone number / mobile phone it could be useful to reach you. We will not give your telephone number to any third parties without your consent. The Club operates an anonymised Vehicle Register which is open to club members only. Your name, location, registration number, owner history and MOT history will not be visible to other club members. Other members may send messages to you through the Register, which you will receive as an email, although your contact details will not be disclosed to others. This approach allows club members to communicate privately whilst satisfying data protection regulations. You can change this setting at anytime on your membership record. Exclude my vehicles from the anonymised Vehicle Register. 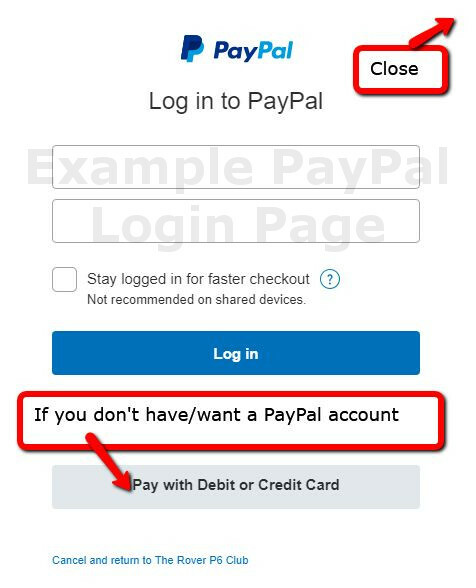 After saving your renewal information, you will automatically be re-directed to PayPal for payment. If you don't have a PayPal account, you can still pay by card. See the image below for which button to press (Click to enlarge). After your details have been saved, you will be able to print out a page (or copy if you don't have a printer) to post with your cheque to the Club. Please review the following statements and acknowledge your consent for the Club to use your personal information in the manner specified below. Printing Company Ltd - Printing Company print and post our Club magazine. They are supplied with address lists in order to print names and addresses on the envelope. Wire Wheels Webbers Ltd - Wire Wheels Webbers provide the Club Membership system Crossmember. Access to membership records is only authorised by the Club if technical support is required. Because we're a car club and keeping a vehicle register is an important part of what we do, we would like to keep your data indefinitely so that we have an owner history of all the vehicles on the register. If in the future, you would like to leave the club, you can ask for your data to be deleted by contacting one of the club officials. How can you update your details in the future? If you wish to terminate your consent with the Club, you can do so anytime by contacting the Club officials. I consent to my personal information being given to The Car Club and used in accordance with normal Club business as described above.